The original NYC hiking trails were blazed by its last native residents, the Lenape. One of those trails went on to become Broadway, which thousands still walk each day. Hiking is in the city’s blood, and you won’t find a metro area in the U.S. that spends more time on two feet. A “sport” more familiar to explorers than the athlete, hiking takes us far enough into nature to suspend the daily BS, but keeps us close enough that we can make our FreshDirect delivery at 4p.m. It’s as simple as a pair of shoes and a water bottle, or as complex as a 20 mile in/out carrying a 20lb backpack full of god-knows what. You didn’t need to bring that much pastrami to “share”. Hiking is a free, relaxing way to explore your city and state. There are many incredible parks and woodlands in the region, and we’ve curated four incredible hiking trails to explore around NYC! Don’t get caught out without the proper gear and guides! Photo by Sakeeb Sabakka. Hiking requires little gear to execute, but preparation is key based on the terrain and weather. Appropriate clothing layers, a snack and liter of water per 3-4 miles of hike, and a map will keep you out of a jam. Trail etiquette is highly appreciated by your fellow hikers. Make sure you Leave No Trace, clean up after dogs or super-adventurous cats, and keep noise pollution to a minimum. Looking at you, sh*tty trail DJ’s. Groups such as NY/NJ Trail Conference and NY Ramblers help expose NYC to fantastic local trails. Their work ranges from info-gathering, to trail maintenance, to organizing group hikes. Support them if you enjoy hiking trails in and around NYC. Smartphone apps like AllTrails (iOS, Android) and View Ranger (iOS, Android) let you view trail-maps and track your progress. Technology’s downside is you are limited to battery life. Pay attention to landmarks and blazes on the trail, and carry a physical map if possible. Located on Manhattan’s northwestern tip, Inwood Hill is home to the borough’s only official forest. If you’re into history, the park’s 2-3 mile hike features remnants of the glacial geology that carved the Hudson River Valley. Inwood Hill is said to be the site of the Manhattan trade that moved it into private ownership. From the top of the park, you can’t miss the scenic Hudson River. New Jersey’s Palisades rise from the western shore. To the northeast, the Harlem River makes its way to meet the Hudson. Wildlife enthusiasts can search for salamanders, Bigfeet, and flying squirrels. Birds in particular are attracted to its woods and marshes. Take the A to 207th St and head west on that street toward the park. Hit up Guadalupe for some outstanding Mexican seafood when you get hungry. This 23 mile trail technically starts in Yonkers, but you can hop off the Metro North anytime to customize your journey. It’s a hike that frequently switches from nature to hamlets, but you’ll get a glimpse of New York history as it modernized in the 1800’s. There are many twists, turns, and side streets, making it an urban explorer’s delight. A map is recommended. Along the way you’ll walk atop remnants of the namesake aqueduct, which used to deliver NYC its water. One weekends, the Keeper’s House in Dobbs Ferry tells the full story of the water-line’s construction. If looking for the nature bit, stare creepily at local wildlife as you hike through state parks and preserves. For TMZ-types, you’ll walk past the gates of upper-crust mansions and a castle or two. Or one. Head north on the Hudson line from Grand Central, head off at Yonkers Station and meet up with the trail on N. Broadway. Horsefeathers is just offer the trail at Tarrytown, and offers stacked burgers and beers. Trail blazes remind you you’re on the right path. There aren’t many hikes that put a waterfall in your face at the trailhead. Bold move. This 4.5 mile loop has everything: views of far mountains, trickling streams, peaceful lakes, stands of birch trees. It’s unfair, really. Also, the park hosts a section of the Hudson Highlands trail system, a lengthy thru-hike from New Jersey to New York. Looking for a quest? Find the park’s Chatfield Stone House built in the 1830’s. If you like the vibe – despite its limited amenities – your group can reserve it for a night. Take in the picturesque views at Eagle Cliff, the park’s highest point. If you need more after this well-rounded hike, Storm King State Park is across Hwy 9W on the park’s northeast side. Grab a car for a day and head north on the Palisades Parkway to US 9W-N. Left on Angola Rd, and a stop at Grandma Phoebe’s Kitchen! Perfect for a sweet breakfast, a coffee, and a hello to the farm animals. After the challenging ascent, Breakneck Ridge has views for miles. Photo by the theTurducken. 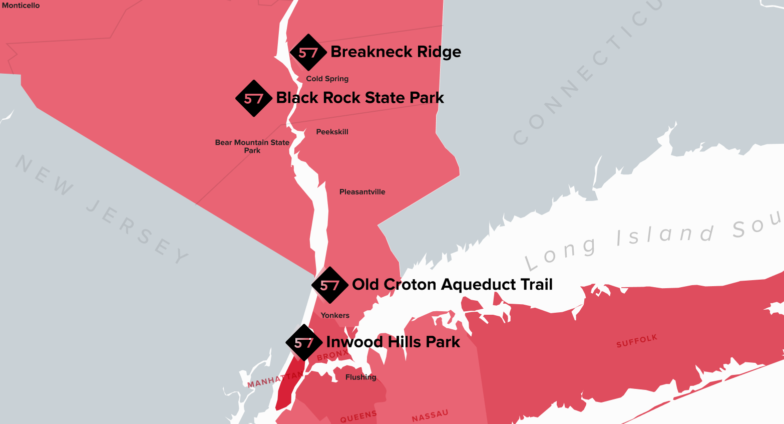 Breakneck Ridge allegedly takes its name from a cow that overestimated its hiking abilities. It’s not for the soft, and you’ll need all fours for this lung-buster. Mile one of six has you scrambling up a thousand feet of rocky terrain. After catching your breath, enjoy the best views of the Hudson in the region. From the top, look for Pollepel Island to the northwest. It’s home to Bannerman Castle, a turn of the century munitions warehouse and architectural oddity. Storm King Mountain looms to the southwest. Shells of buildings are scattered atop the ridge to explore. From the white trail, take a left at the red “Breakneck Bypass” to cut it short, or continue on and loop back on yellow. On weekends only, the Hudson line from Grand Central stops at Breakneck Ridge. On, off-days, Cold Spring and a cab. A beer and wood-fired pizza at Riverview in Cold Spring will revive your weary body. Hit the NYC Hiking Trails! There are hundreds of trails for hikers of all abilities around NYC and the tri-state region. According to recent studies, those who spent extended time in nature saw increases in cognition, mood, and less risk for depressive symptoms. If you hear ma nature calling, answer her! Looking to kick your trail skills up a notch? Multi-day hikes or backpacking excursions are the next big step in the trail game. It’s important to brush up on your survival skills for those longer trips. Peep our review of an introductory wilderness navigation course!